Mists of Pandaria has introduced a lot of changes to all the classes, as is normal with any expansion. When Cataclysm launched I spent hours obsessively scouring each PTR patch note and news release for any change. So I had a pretty clear idea of how the rather fundamental changes to the game, and healing in particular, would play out. Come Mists and I did none of that. In fact, since it's launch I've spent far more time in my Protection Levelling/Questing/Pull-Twenty-Mobs-And-Mow-Them-Down spec than I have healing. So the past few weeks have been spent not only in a frenzied effort to raise my gear level from its former barely-enough-for-LFR level to something that wouldn't completely embarrass me in a normal mode Throne of Thunder 10-Man, but it's also been a steep learning curve to fully understand my class again. Big things like Talents I had a pretty decent grasp on, at least in the broad strokes, but in reading up on them in the excellent Bossypally Talent Guide I realized that some of my choices were less than optimal. Particularly Hand of Purity, which had been transformed from middling to awesome since the beginning of the expansion, a talent that I had never really considered before that I now consider an essential tool. I also didn't fully appreciate the effect that normalizing Mana would have on Paladins. In all previous expansions, Intellect was a Paladin's no-brainer, don't-even-think-of-gemming-anything-else-dumbass, best Stat. Not so for Mists. Now the once lamented Spirit is a Holy Paladin's best friend, to the point that the once useless Blue Gems are pretty much all I need now. That was a head-scratcher when I first read about it, let me tell you, and it went against two expansions worth of common sense. Similarly, Mastery is now such a viable gearing strategy that Ask Mr. Robot considers it the default way to build a Holy Paladin, relegating a Haste-heavy build to the status of the Ugly Cousin that ain't quite right in the head. I admit, I took the lazy route this expansion: at the start of Mists I didn't do much in the way of homework on my class, and just kept gearing and gemming and playing the same way I had in Cataclysm. But there's nothing like a Raid Boss to quickly show a person just how bad the lazy way is. in a long time. Please ignore the skeletons. I have officially been a Raider again for three weeks now. My new guild Acquired Taste is full of excellent people who were more than willing to help me get geared up, as well as hand-hold me as I learned the new fights. Their help, as well as some getting some long-awaited good loot-luck in LFR, has seen my iLVL rise from 476 to 501 in three short weeks, still on limited play-time. I'm managing to keep up with the other healers, despite my still-inferior gear. But lordy, it's been a challenge. Walking on to a raid team that had three bosses on farm that I had never before encountered or even studied, being expected to contribute in a meaninful way and not hold the raid back, all while sporting several blues and one or two PVP gear pieces. Not to mention that this is a brand new guild for me and I'm still in my probation period, so if I don't impress I run the risk of losing not just my raid spot but potentially my new guild as well. But hey, no pressure, right? In the end I think I've done pretty well. The first week we downed Tortos for the first time, and we followed it up with a last pull of the night, three-people-left-standing Megaera kill the week after. Our third week saw Ji-Kun fall, with the Battle Medic on nest-healing duties. It's felt great to be back raiding again. 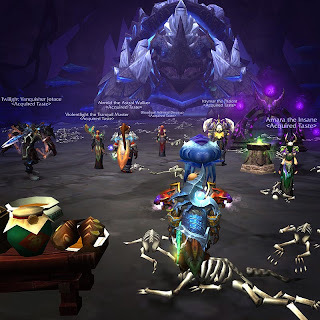 The people I'm with are great, the Throne of Thunder raid is excellent and it's nice to finally be caught up with the game again and to feel like I've got things under control. What? Patch 5.3 dropped today? It's got a whole bunch of new stuff to figure out, two new epic questlines and dozens more dailies to do? ..despite your state of under-gearedness when you first arrived, you had me sweating. "This guy is NOT allowed to be healing anywhere CLOSE to me!" Oh, come now Nurz, don't be hard on yourself. I'm certain that you will always be a welcome part of the raid team. We can always use a Water-boy, cheerleader or "Equipment Manager". You can always farm and make the feasts for us! 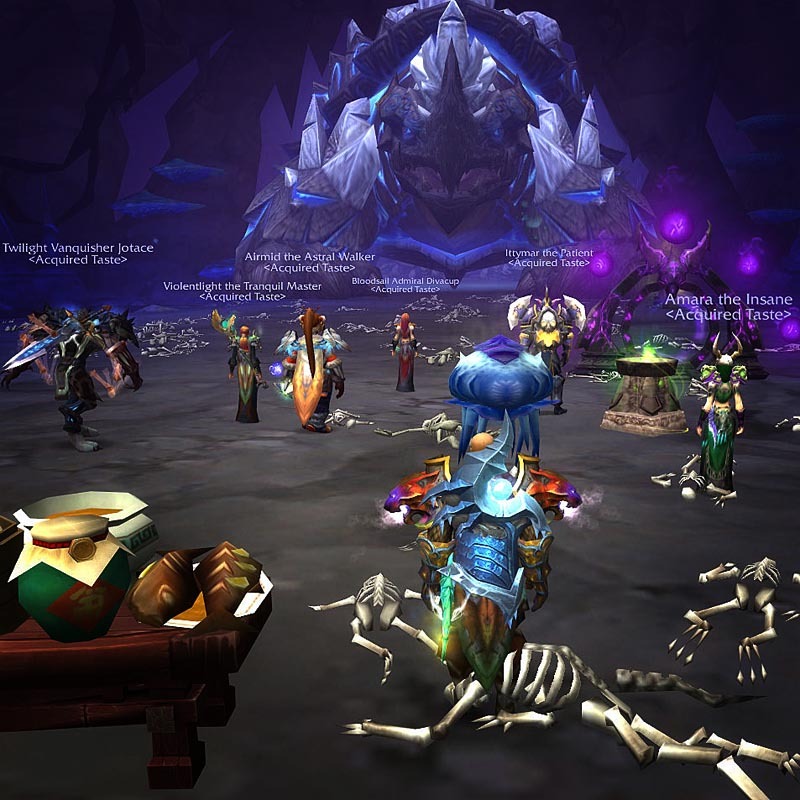 Actually, it was a little intimidating to step into that raid group and fill your shoes knowing that they would be judging me based upon how you used to do things. That first week was nerve-wracking as hell. But, it's made me pay more attention to my cooldown usage (still bad!). There's nothing better than fear to motivate me into being better.